"Ronald Reagan used to tell the story of a boy so optimistic that when he woke up on Christmas morning and was confronted with a huge mound of manure, he gleefully began shoveling. "There's a pony in here someplace!" he exclaimed. For President Bush, when it comes to Iraq, every day is Christmas day. He's been shoveling for more than four years but still fully expects that pony to pop out at any moment. On Capitol Hill, though, even Republicans are starting to suspect that the malodorous pile is that and nothing more." 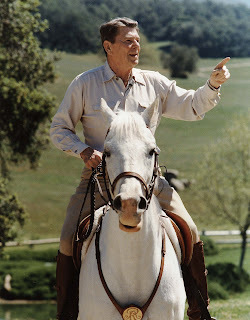 Even some (real) conservatives are starting to see that George W. ain't no Ronnie. 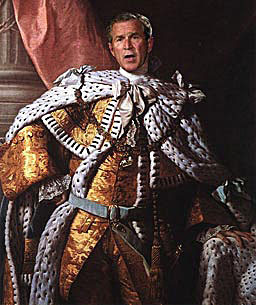 "George W. Bush is the imperial president that James Madison and other founders of this great republic warned us about. He lied the nation into precisely the "foreign entanglements" that George Washington feared would destroy the experiment in representative government, and he has championed a spurious notion of security over individual liberty, thus eschewing the alarms of Thomas Jefferson as to the deprivation of the inalienable rights of free citizens. But most important, he has used the sledgehammer of war to obliterate the separation of powers that James Madison enshrined in the U.S. Constitution. With the "war on terror," Bush has asserted the right of the president to wage war anywhere and for any length of time, at his whim, because the "terrorists" will always provide a convenient shadowy target. Just the "continual warfare" that Madison warned of in justifying the primary role of Congress in initiating and continuing to finance a war -- the very issue now at stake in Bush's battle with Congress." It's been a while since I went off on Bush, mostly because I figure that anyone left needing convincing is a lost cause. 20-30% of folks drank the Kool-Aid, and they would certainly be following Hitler if he were in George W's spot. Congress would do well to reconsider articles of impeachment....I know that would not be best for the Democratic Party, but it would be best for our country. We don't need no stinkin' king! JEB Stuart Class of 1987 has a list of downloadable hist from 1987, I thought some of my classmates would enjoy these, so here you go. Doug Marlette died in a car wreck last week. I didn't care too much for Kudzu, but his political cartoons were second to none, and his wit and wisdom will be missed. What a shame! Here's a link to his website. And here's Daily Kos's take.